To reflect the growth of the Allied Health Professions at the University of Limerick, the School of Allied Health has been launched. The School of Allied Health comprises the disciplines of Dietetics, Occupational Therapy, Physiotherapy and Speech and Language Therapy. Attending the launch of Allied Health and Living Showcase in UL recently were Dr Carmel Mullaney, Specialist in Public Health Medicine, HSE, Dr Katie Robinson, Senior Lecturer and Discipline Lead Occupational Therapy, School of Allied Health, UL, Professor Sue Franklin, Professor and Discipline Lead Speech and Language Therapy, School of Allied Health, UL, Dr Norelee Kennedy, Head of School and Senior Lecturer in Physiotherapy, School of Allied Health, UL, Ms Fiona Steed, Group Lead for Allied Health UL Hospitals and Professor Susan Coote, Associate Professor of Physiotherapy, Dept. Of Clinical Therapies, UL. 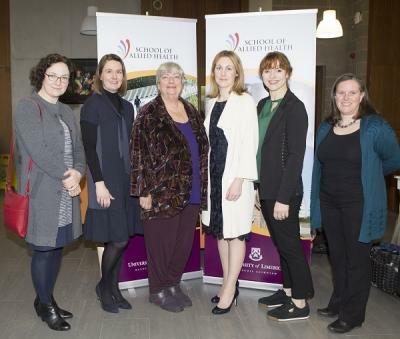 To reflect the growth of the Allied Health Professions at the University of Limerick, the School of Allied Health has been launched. Formerly known as the Department of Clinical Therapies, the School of Allied Health comprises the disciplines of Dietetics, Occupational Therapy, Physiotherapy and Speech and Language Therapy. In launching the School of Allied Health, Dr Norelee Kennedy, Head of School described the new school as an exciting new chapter for health professions at UL. Staff in the School are looking forward to continuing to build on the excellent reputation firmly established by these professions at the University of Limerick.